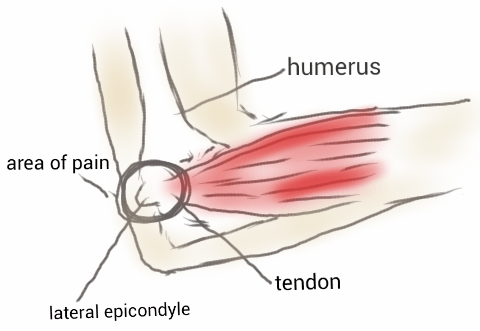 This is my experience dealing with tennis elbow (Lateral Epicondylitis), This is a long article but wanted to give as much info as possible as I know a lot of people are in the same situation as me. Mine started about 6 months ago when we moved into a new house. The new house needed completely gutting one of the main job I had to do was paint all the ceilings as they hadn’t been touched in about 30 years so they need several coats of paint, I’m normally a very active person because of my jobs and also I do any diy necessary including decorating, fitting carpets, woodwork, putting furniture up, shelves etc etc so normally painting a ceiling wouldn’t be a problem doing this kind of work, but a few days after doing this work I had severe pain in my elbow and arm, I just thought at the time it was just normal muscle pain and thought it would go away. Though after about a week the pain was getting worse and didn’t seem to subside even with pain killers like ibuprofen or paracetamol, so I went to the doctors. The doctor examined me and pushed just right on the joint of the bones in my elbow and that is where most of the pain was and told me that is was tennis elbow due to the repetitive movement of painting the ceilings. So I was just to take pain killers and he gave me some pain relief cream to rub into the affected area. Though he did also say to rest my arm, but that was impossible due to all the work that needed doing to the house. Over the next few months the pain didn’t seem to be getting any easier. I had been to doctors a few times in those few months, they gave me stronger painkillers codeine to take with the ibuprofen. On one of the visits I had to self-refer to physiotherapy as was quicker to do it this way than the doctors referring me. This took a few weeks before the referral came through and then took a few weeks before the earliest appointment. The pain sometimes was that bad that I couldn’t really do anything some days. I did try to use my other arm but because I’m right handed and that was now my weak arm, it is very hard to use the other arm and hand. There was days that I couldn’t even hold a cigarette in my right hand as was so painful in my elbow and even a few days when I was unable to drive at all. About two weeks before my first physio appointment I had woken up one morning and could move my arm at all, my whole arm felt really heavy and the pain was all up and down my arm. After about an hour or so of waking up thinking it would just go away and didn’t, I had painkillers and tried the gel on my elbow, but this was making no difference at all. Half way through that day and still unable to move my arm I asked the missus to take me to A&E as this was the first time for hours on end couldn’t move my arm at all and it wasn’t just because of the pain I physically couldn’t move it. So off we went to A&E only had to wait a little bit as was pretty quiet. I had x rays then seen the doctor who said it again was still tennis elbow and to do as the GP had said. Under normal circumstances I don’t go to a doctor and rarely go to A&E, but this day did need to go as was a completely weird feeling that had no feeling and no physical movement in my arm, which did worry me though this did put my mind at rest there wasn’t any other problems. The felling and movement didn’t come back into my arm until later that evening. The first physiotherapy appointment was really informative in which he explained about different exercises to do, though some of these I knew about as did research on the Internet but the exercises he showed me wasn’t as painfully as the ones I had read about before, these were supporting my arm on a flat surface like a table and with a support pulling down letting go then repeat. There was also another one that I didn’t know using the frame of a door to support my elbow and having a rolled up towel in my hand and lifting my arm up and down. I did try these over the month following though sometimes did cause more pain, so I admit couldn’t always do them daily and if did them sometime couldn’t complete the whole set of repeats. Also was told to do cold compress on the elbow. This was using ice in a towel and applying to my elbow for about 10 to 15 minutes. I found the best way to do this was using a small coldpack that I put in the freezer, then put this in a tuber grip and hen around my elbow as I found at least I could do things with it on, as doing the normal ice way was starting to ache my other arm as was having to hold it against the elbow. NOTE: I have just written the basic of these exercises please don’t try these basic instructions I have said unless advised by professional. The physiotherapists also suggested acupuncture and explained that it may help. I have never had acupuncture though the missus had it a few times for her condition but she did have adverse effects on her so she couldn’t continue, though I thought for me would be worth a try so I agreed. He had to do a few checks to make sure though that I was suitable for acupuncture, then made appointments for a few weeks later comprising of three sessions. That night after the first treatment I slept really well, though the next day was that tired I couldn’t do anything at all. In the week that followed the first acupuncture treatment, I wasn’t to sure if worked or not as because the pain comes and goes and also depends on what I am doing. On the second appointment which was twenty minutes long this time and the needle were tapped twice in this time, again we painful when two needles went in but not really a problem. After this session the following week it did seem to make a difference to the pain. I would say about 50% difference. The day before my final and third acupuncture session, I had problems with my wrist, I’m not sure what I had done I just had a lot of pain in my wrist and in my thumb. The day of the acupuncture I still had the pain though I did try to have the treatment, the first three needles went in and did cause me a bit more pain than normal, but then one of the needles that normally did cause me pain really did hurt. Though I did carry on but after the last one that was put in I couldn’t move my fingers even a small amount as the pain was really bad, so I had to stop. The physiotherapist did examine my wrist and wasn’t too sure what was going on so arranged another appointment for a week later. I went again a week later the pain in my wrist was a bit better but my elbow and arm seemed to be getting worse. My arm felt so heavy and I was having trouble using my arm and the pain was getting worse. I was then referred to his colleague, he agreed it was tennis elbow and referred me to other physiotherapist for possible corticosteroid injection. Though this would be another three weeks away. I was told not to do the exercises and to only do cold compress. To be honest I couldn’t wait for the appointment to come along as the pain was getting worse and really stopping me from doing jobs. I went to this appointment she examined me and talked about the exercises etc and if they had been helping and then she said about the corticosteroid injection, told me about the side effects and that I would have to rest for about 7-10 days, so no proper work for this time. She offered it me then and there which I was surprised about. So I had it, the pain as the needle went first in was OK, but then the pain was the worst pain I have ever had from an injection, it felt like my elbow was on fire at least the needle only lasted for about 30 seconds. I was told to take painkillers for when the anaesthetic wore off in a few hours, though as I got in the car to leave my arm started to feel really heavy, so I take some painkillers. When I got back home my whole arm was still hurting and throbbing, so just kept taking ibuprofen and codeinel. Through that day my whole arm started throbbing even more and getting really heavy, that night I tried to go to sleep earlier and was starting to feel really tired, but just couldn’t settle as my arm at this point was that heavy I was having trouble moving it, I had to use my other hand to lift my arm. Then I started losing feelings in my hand and fingers, the pain was all up and down my arm and started to go into my shoulder and right side of my body. I cannot fully describe the pain I was in, though I was like pain I have never had. The only way to describe it is that it was like a red hot golf ball in my elbow and then my whole arm felt like a tonne of bricks and completely throbbing. Eventually I did get to sleep, though kept waking up about every hour. By the next morning I could not move my arm above stomach level, it was really hard to have a shower and even had to get my daughter to button up my shirt. The pain did start to subside late that afternoon, though was still taking the painkillers which was taking the edge off the pain. The following few days the pain had started to get better though I am having to rest it, at the time of writing this I’m now on my 6th day after having the corticosteroid injection. The pain in my arm is better as I now don’t have the throbbing permanently in my arm, I still get sharp pain in my elbow. Though at the moment I am mostly resting it other than doing normal carrying jobs and normal things around the house. So this may change once I start using it more, I will keep posting updates on my progress. It is now over 4 weeks after the injection in my elbow and I have been given the all clear from the physiotherapist, she check my movement and was all ok. The pain that I had in the first few days after the injection as now gone, after about 3 weeks my arm / elbow didn’t hurt at all, it was like I never had the problem. I still have to continue with the exercises and this will help strengthen the tendon to stop it recurring.